Homies! This is my 100th post!!! Woooohooo!!! And what better way to celebrate than with a Tuesday Top 5! 1. Sea Harbour Dim Sum. Ohhhh man you guys. I have always loved dim sum! Always. Its one of my favorite ways to start off a weekend morning. My whole life I have gone to Chinatown for dim sum. And I like it. And its good. But it had been pointed out to me by many a person that for the best and most authentic dim sum in the city, I must get myself to the El Monte/Rosemead/San Gabriel/Arcadia area. It finally happened! My mom, my step-dad, my beautiful niece who is growing up way to fast, and I hit up Sea Harbour Dim Sum in Rosemead. It was DELISH!!! The shrimp har gow was big, juicy and the dumpling skin was so soft and tender. Also loved the Shrimp in Rice Noodle, and Shrimp & Chive dumpling yummmm. But my favorite had to be Shrimp & Dry Scallop dumpling. I will say “dry scallop” sounds scary, and I am not sure still exactly what it means…but it is TASTY. YUM. Then we finished off the meal with hot milk bun for dessert. I have never had that before but it rocked! Warm, doughy, sweet, creamy center. Oh boy. So now the question is…when can I get back?? 2. Hubby On Spring Break. My hubby is on spring break right now and its great having him home!!! I am so glad he works a job he loves and inspires little middle-schoolers to think and write amazing poetry and expand their minds. But you know what, I am kinda selfish and want him home with me!! I just like looking at him. And forcing him to laugh at my jokes. So I am trying to enjoy every single moment of his break! Because he rocks my world! 3. Bastide. Last week was my mommy’s spring break! Which meant ladies lunch! Holla! My mom & her friend/my honorary aunt Barbara and I went to an amazing lunch at Bastide. Barbara picked the spot, which is always good because Barbara has the BEST taste in food and knows the best restaurants in the city! Did I mention I LOVE fine dining?! If I ate meat I could have loved being a food critic! Because me and LA’s dining scene? We know each other well. So back to Bastide. The courtyard is gorgeous- it definitely feels very European! Oh and the cute french waiters didn’t hurt either (AJ, you didn’t read that). But what I was there for was food. And boy did we eat a lot of amazingness. We split yellowtail sashimi with radish and green beans, oysters, roasted beet salad, and smoked salmon tartine and ahi tuna nicoise! YUMMMM. The yellowtail and oysters were my fav but really everything was so good. The food is just fresh, clean flavors and delicate. I like that! Anywho…then we had dessert Apple Tarte Tatin (one of my favorite desserts ever) and Beignets with 3 dipping sauces! BOY OH BOY it was all so good! I am spoiled for sure! 4. Hawaii Fever. Aloha, my name is Ashleigh and I have Hawaii fever. It happens every spring, I get the craving to go to Hawaii. Because Hawaii is amazing. Beautiful beaches, warm clear water, stunning sunsets, mai-tais and lava flows, trade winds, ahi poke, coconut & macadamia nut breakfast concoctions, tropical gardens, lush scenery…I could go on and on about why I just LOVE Hawaii! Sadly I doubt its going to happen this year. But Hawaii is definitely on my mind! 5. Amazing Clients. You might be annoyed because all I do is talk about my amazing clients. But can I help it if the people who work with me are fabulous?? Last Thursday I shot a boudoir session and the bride blew my mind. The bride brought so many cute outfits, fierce accessories and props! Girl took my tips on what to bring for a session and ran with it! LOVE that! Then this weekend I shot Syl & Christina’s engagement session and they blew my mind as well with their cuteness! It was an amazing colorful session with lollipops and laughter! Can I ask for anything more?! I feel so so so lucky to be working with so many awesome people! People who wear their hearts on their sleeve. People with their own unique, fun style that they rock with confidence! People who laugh hard and smile bright! I love these people, these clients, these FRIENDS. I am the luckiest. You all rock my world more than you know! 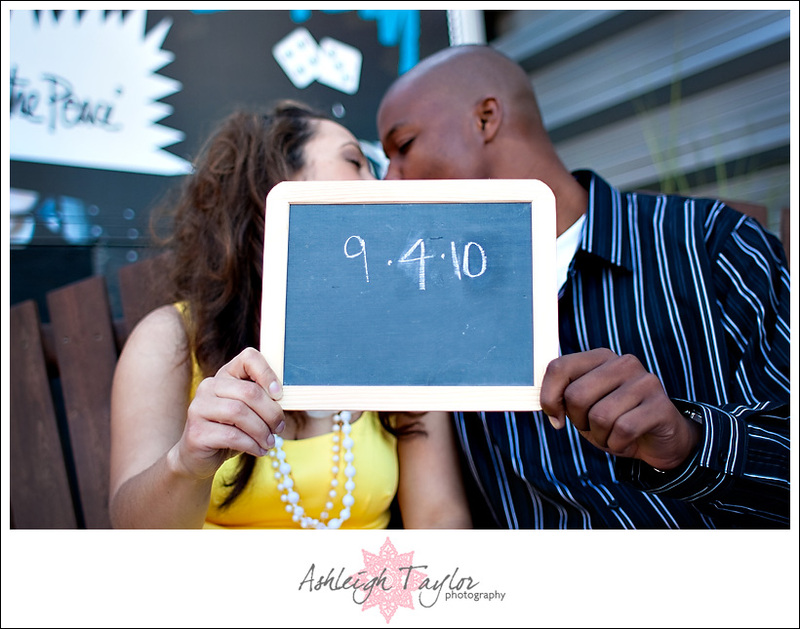 And now check out a teaser from Christina & Syl’s amazing session! Jessica - oh my gosh I love this pic so much! Christina - Ashleigh, don’t give up on Hawaii just yet. Spring is still young. Did I mention…. You are the Shizzle! We had so much fun and can’t wait to see the rest. Ekk! SueLee - OMG! LOVE IT!!! Sean - Hear you about Hawaii, Ashleigh. Definitely have that craving as well.